This month we are honored to recognize another Veterans home resident who proudly served our country in the United States armed forces. George Carper was 17 years old. 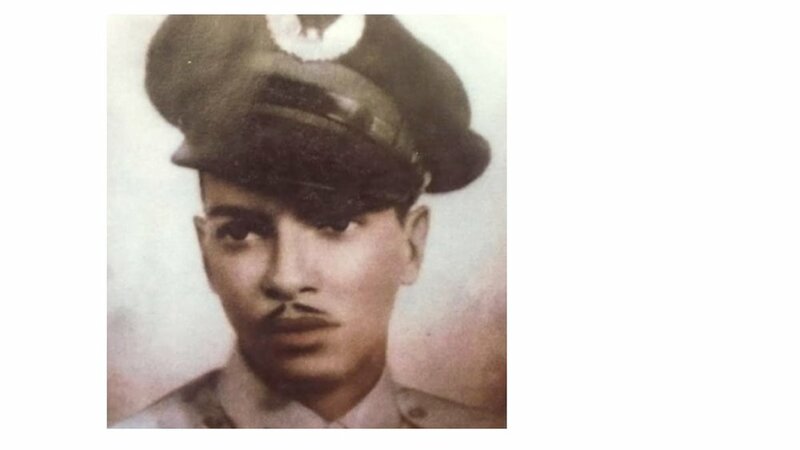 He was too young to fly, but the United States Army Air Corps said he could train to become an aircraft mechanic. “I don’t want to be a mechanic,” the disappointed young man said to his dad. According to George, his father’s reply, “you wanna fly, don’t cha?” was both practical and prophetic. George took the training and soon became crew chief to a cadre of skilled mechanics who maintained 30 training aircraft (PT-13s) in top flying condition. Airman Carper also earned his pilot credentials. Young George Carper in training to become a venerated Tuskegee Airman. Mr. Carper became a Tuskegee Airman at a dangerous time in our nation’s history. We were at war in two parts of the world. In Europe, Germany was doing serious damage to allied air power. The United States needed more well trained combat pilots – and quickly. Putting more Tuskegee airmen at the controls of our fighter planes was seen as part of the solution. To do this, we needed a top-notch trainer plane for students to build the skills needed to move up to advanced fighter aircraft. Responsibility for maintaining this essential fleet of training planes fell to Airman Carper, who worked for five years in this capacity. Were these combined efforts successful? After achieving good results as the 99th Pursuit Squadron, Tuskegee pilots now flying as the 332nd fighter group escorted over 200 bombing missions over Europe during World War II and established a record that was never to be equaled. Great credit is owed Tuskegee airmen maintenance personnel who performed with skill and dedication throughout the war. At Missouri Veterans Home, we say “thank you” to crew chief, Airman George Carper, for helping to keep us safe during a dark time. What is life like after war? For George Carper, life has been very full, indeed! As a teenager, George worked in the family business, Carper Casket Company. Later, George married. He and his lovely wife, Imelda, cherished 64 years together. Imelda passed in 2014, leaving two daughters, Jacqueline and Carol, and a son, George III. George Carper’s work ethic has served him well. The company founded by George’s dad has flourished. With George as president of the firm, conscientious attention to fair play and a focus on fine quality and compassionate service, has put Carper Casket Company at the top in the industry and the community. “Congratulations George on your journey from Tuskegee Airman to successful business owner”. On March 29, 2007, Tuskegee Airmen were presented the Congressional Gold Medal at a ceremony in the rotunda of the U.S. capitol. Airman George Henry Carper II was among those so honored. George cherishes this award and all of the men and women who have accompanied and supported him throughout the years. Near the end of our talks about his long and illustrious life, George related this: it seems that early in his work as an aircraft mechanic, he was approached by a particularly irritating (white) young man who said, “you people can’t drive a truck!” implying that flying a plane was wa-a-ay out of reach. Keep flying, George — and, thank you! George receives a Certificate of Appreciation from SGT Poitras, and Bliss (the dog is a Silver Star recipient). The STL Veterans Home Assistance League will soon be a 501 (C) (3) non-profit organization established for the enrichment and betterment of the lives of the veterans residing in the St. Louis Veterans Home.